They lived happily there for 3 ½ years, but then another little boy was born. Furniture was shuffled, the crib was set up in the smaller “boys’ room” and 3 ½ more years passed without complaint. But you can’t keep a kid in his crib until he’s 18. When we noticed that Episode VI had to put his feet through the rails of the crib to stretch his legs out completely, we knew it was time to get him a “big-boy bed”. But with no more space in the smaller “boys’ room”, there weren’t many options option beyond a complete boy/girl bedroom swap. 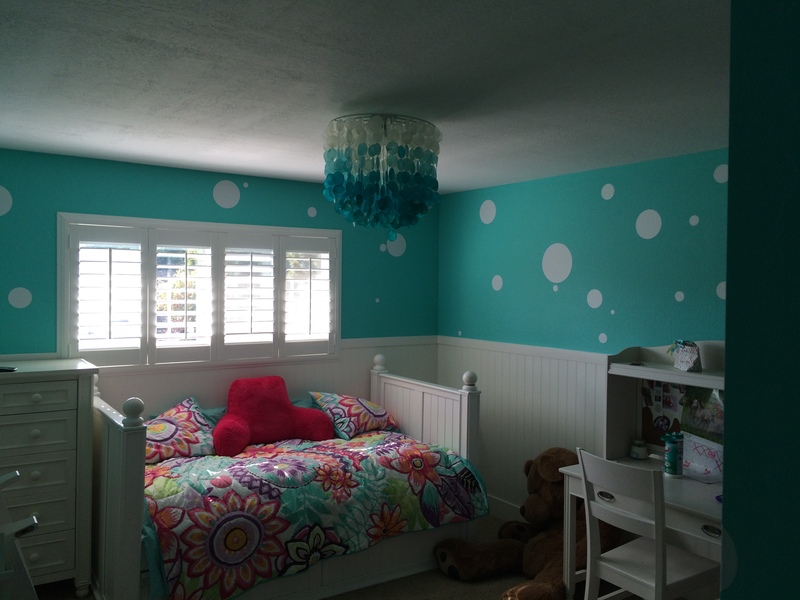 That meant turning a “boy room” into a “girl room” and turning a “girl room” into a “boy room”, and that meant saying goodbye to the murals I’d poured my soul into seven years earlier. Thankfully Episode IV was gung-ho. We gave her some creative control over her new living space and (with a little guidance from UnDorkMommy) she ran with it. 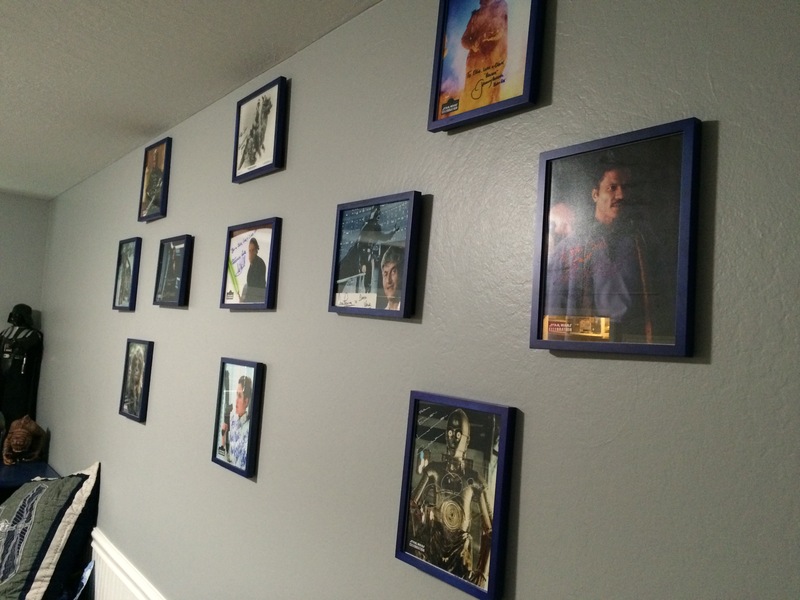 Here, converted from what used to be a Batman/Superman “boy” room, is the beautiful final result. It turned out great. 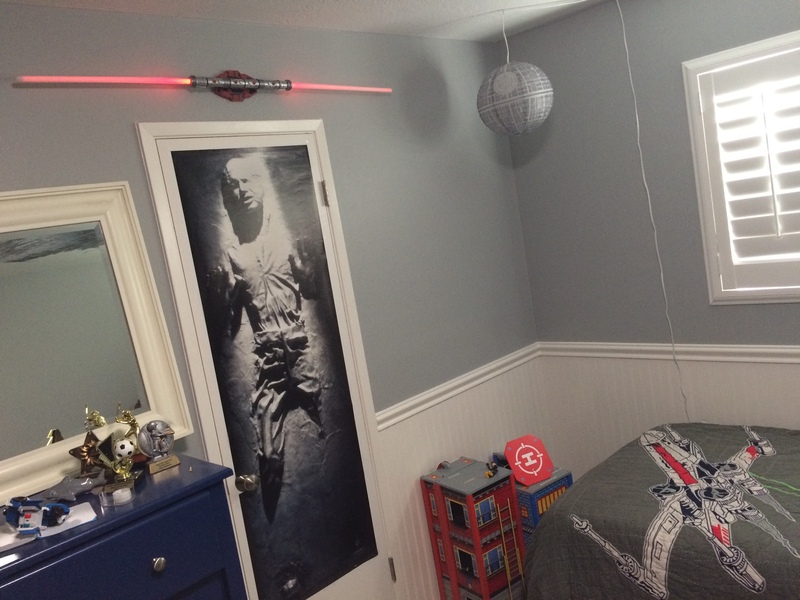 The real challenge for this DorkDaddy though, was what to do with the boys’ new room. The Batman/Superman thing was already done. We needed something that would appeal to both boys, something a little more grown up that would carry them at least into high school. Let’s just say they accepted my first suggestion with boisterous enthusiasm. The theme was selected. The target was set. I was up to the challenge. 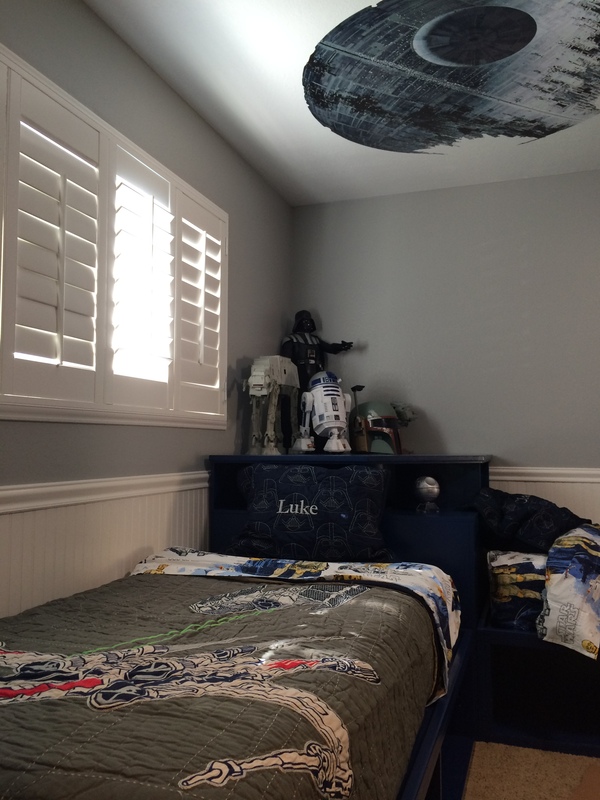 We were making a Star Wars room! I’ll admit, I was secretly (not so secretly) planning for this moment my entire life. I’ve got boxes and boxes in the attic filled to the brim with carded Star Wars action figures, spaceships, playsets, posters… on and on. 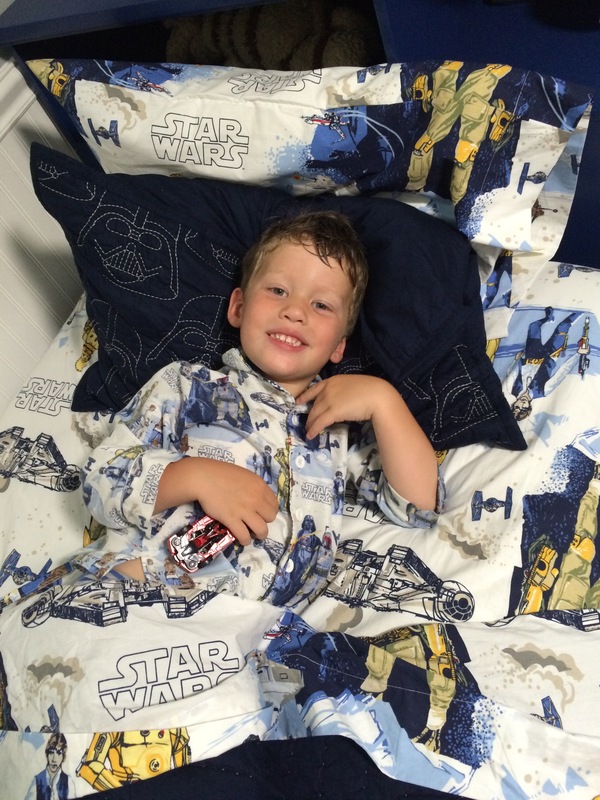 When Episode VI was born Pottery Barn Kids was selling a special Star Wars bedding set (they sold so well they have since become a regular staple in the catalogue). I snatched them up *just* in case and saved them in the attic along with all my other treasures, knowing (hoping) this day would come. 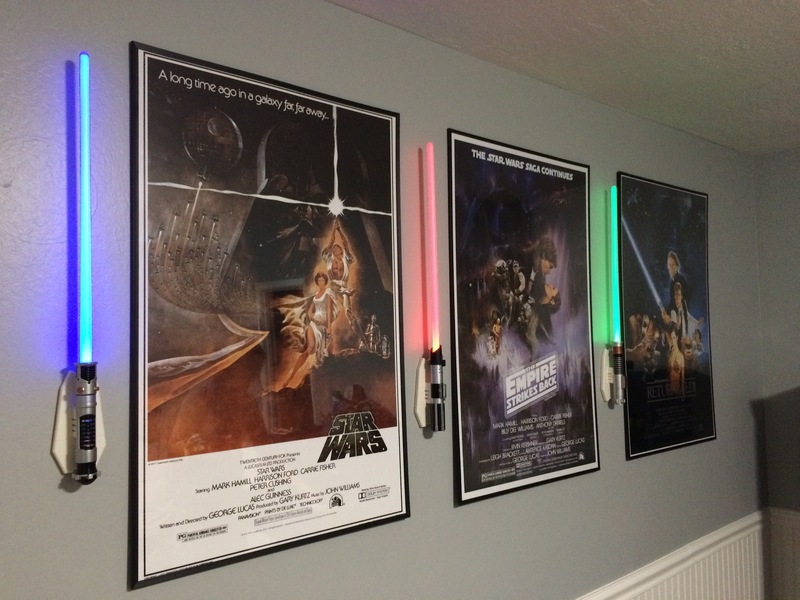 Suffice it to say there were 12-party, multi-national negotiations between me and my profoundly less-dorky wife as to what *exactly* would go into the “Star Wars room”. Her sensibilities demand that everything looks like it came straight out of a Pottery Barn catalogue. I, on the other hand, had a lifetime of wild ideas pent up and waiting to explode in a tidal wave of obnoxiousness (think fiber-optic star field on the ceiling or moving my working stand-up 1983 Star Wars arcade game into the room). Eventually though, we came to terms. Sure, I snuck a few little details under her radar (like a Bluetooth Death Star speaker on their nightstand so I could startle them awake from a deep slumber with Darth Vader’s Theme), but ultimately we were able to find a middle ground. 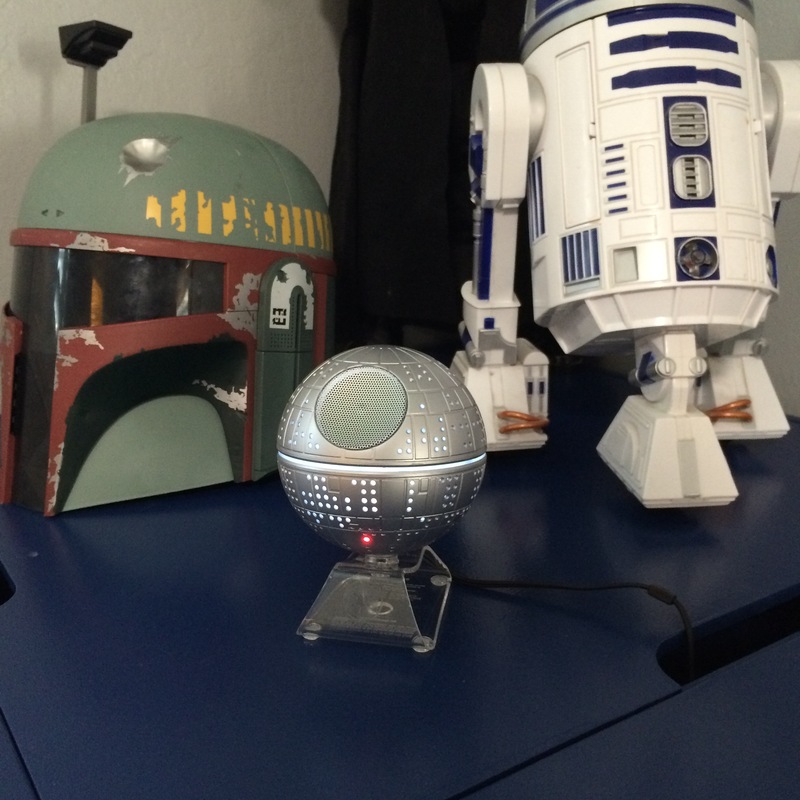 I could go into details about the specifics of the room (Yes, that is a 4-foot decal of the Death Star on the ceiling. 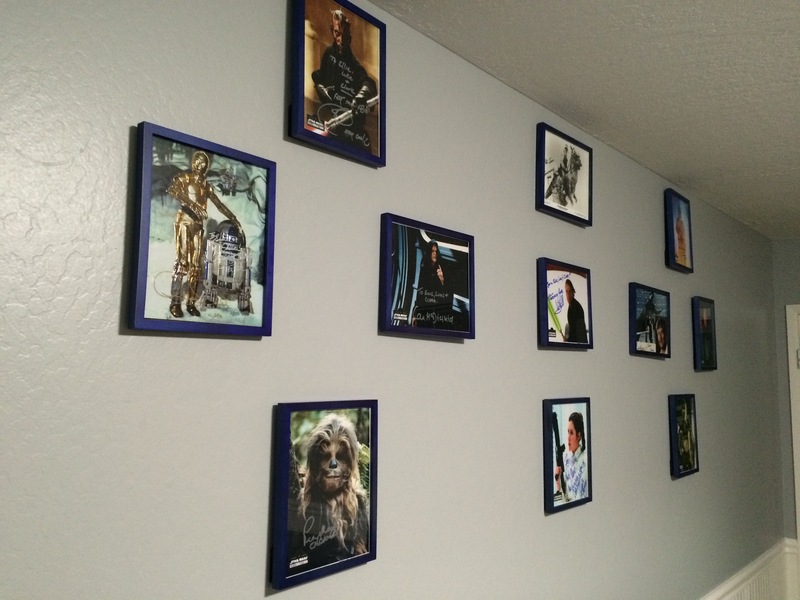 Yes, those are personalized autographs the kids got in person when they went to the Star Wars Celebration earlier this year) but truly, the pictures speak for themselves. At the dawn of a new age in Star Wars history, my kids are about to get a trilogy to define their childhoods just as I had mine. 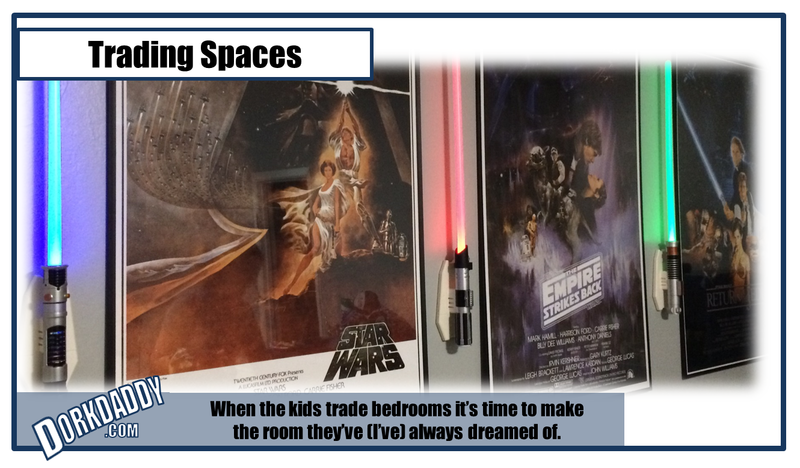 Doubtless over the years there will be additions to the room that have not yet been dreamed up in the Lucasfilm imaginarium. But for now I’m just happy I was able to give them the bedroom of their (my) dreams.